Stevens Point East Development TIA - TADI - Traffic Analysis & Design, INC. Stevens Point East Development TIA - TADI - Traffic Analysis & Design, INC.
TADI's Role: To provide designers with turn lane and traffic control recommendations for initial buildout of planned developments within the study area, plus planning-level cross-section requirements for future roadways. This traffic study was prepared to determine the geometrics needed on these first new roadways with initial buildout of area developments by 2020. As development occurs within the East Park Commerce Center in the City of Stevens Point, Portage County, Wisconsin, new north/south and east/west roads will be constructed. The new roadway network will provide cross-access between Brilowski Road (CTH R) on the west, McDill Avenue (CTH HH) on the south, and Burbank Road on the east. 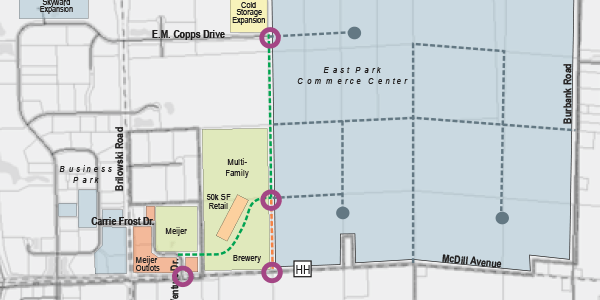 Recent development plans for the western portion of the East Park Commerce Center will result in the partial construction of the future roadway network. This traffic study was prepared to determine the geometrics needed on these first new roadways with initial buildout of area developments by 2020. It was also prepared to determine planning-level requirements needed with the likely future buildout by 2030 as well as with an ultimate future buildout of the entire site.